Guitar amplifiers vary in many ways; sound, and how they're made. Before the digital technology of today, tube amps were just about the only available option for electric guitarists. With digital and transistor technology, guitar amps now come in both Tube and Solid State form. Tube Amps over the years have been the choice of many serious electric guitarists. If you&apos;re serious about your playing and tone, a tube amp might be for you. 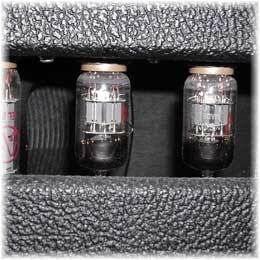 Tube amps usually cost more than solid state amps and also cost considerably more to maintain. Keeping up with changing your tubes and other routine maintenance can prove to be pricey. This hasn&apos;t seemed change the mind of too many guitarists willing to deal with maintenance costs. Tube amps played at higher volumes tend to bring out the tone of these amps. By overdriving its preamp tubes, tube amps create a clipping effect that produces the overdrive and distortion tones associated with tube amps. Most tube amps come with a standby switch which allows the mains of the amp to warm up before powering up the rest of the amp. This is important for sustaining tube and life. Solid State Amps generally cost less money, and are easier to maintain. The price of tubes, biasing, and other tube amp related expenses might not be something you want to deal with. Solid state amps offer a good sound for typically less money and are often a great starter amp. Over the years many solid state amps have improved as far as recreating the tube sound, but many die hard tube amp users swear by the sound and tone of tube amps. It has become increasingly harder to tell the difference between a solid state amp and a tube amp in sound recordings. Many solid state amps offer digital effects or amp emulators built in. Amp emulators mimic the sound or tone characteristics of a selection or specific amps. Solid state amps can be played at lower volumes without losing overdrive or distortion since they don&apos;t rely on tube output to cause distortion. This makes solid state amps a good choice for a beginner amp or even a practice amp even your neighbors would approve of. Combo Amps are guitar amps with a single speaker or multiple speakers built into the same enclosure. Combo amps generally come with a 1x10", 1x12", 2x12", or 4x10" speaker combination. The enclosures of combination amps are either open or closed. The tone of the amp is greatly effected by an open or a closed back enclosure. Amp Heads are the brains of the amp in an enclosure without speakers. Amp heads must be paired up with a speaker cabinet. Full and Half Stacks are speaker cabinets with 4x12" speakers; half stacks refer to a single 4x12" speaker cab and a full stack is a pair of 4x12" speaker cabs.